Choice Broking Franchise is a well established broking franchise headquartered in Mumbai. 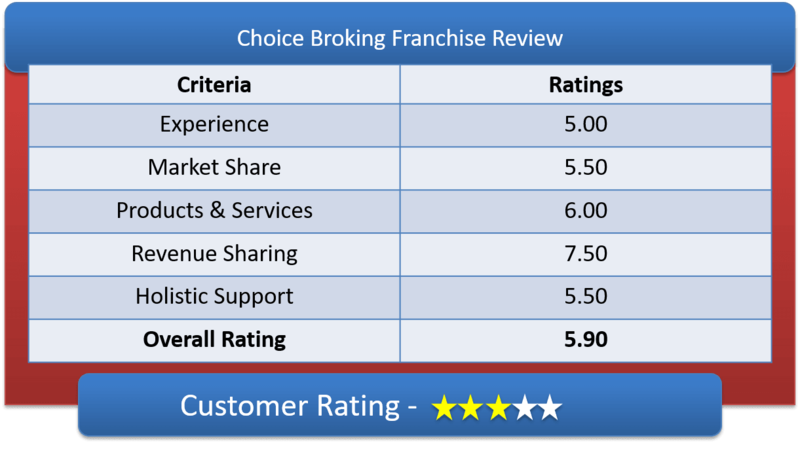 Lets have a detailed Choice Broking Franchise Review & deep understanding of Choice Broking Sub Broker Offerings, Choice Broking Franchise Revenue sharing models & other features of Choice Broking Partner Program. First received the exchange member of NSE, BSE, MCX-SX, MCX, NCDEX and has DP with CDSL in the year 2010. It is also a registered as Mutual Fund distributor. So, basically you have all financial services in offering. Choice Brokers are new to the market with their presence just a decade, but within 7 years their growth has been exponential, all due to right team work and awesome working principles. In 2012, the got registered for SME segment of BSE as a Market Maker. In 2015, the company launched a mobile trading platform and HTML5 web-trading platform known as Investica. Choice Broker focuses greatly on R&T for client satisfaction. They are currently only offering sub-broker option as their Business Partner. Earlier they were of offering Remisier which they stopped recently. Here is a detailed overview of Choice Broking Revenue Sharing process & Initial Investment amount levied by the broking house. Revenue sharing model of choice broking is very simple & straight forward. To start with they charge based on 75:25 ratio. This very competitive compared to other broking franchise. This means that the sub broker gets to keep 75% of the revenue generated & broking house keeps 25%. This model gets even better for sub broker over a period of time if the volume of sub broker is really good. For high volume sub brokers, this number can go to 80:20 ratio. A Sub broker needs to pay Rs 50,000/- (fifty thousand only) which is refundable at the time you give up the venture. The Franchisee will have to bear the expenses of running the office and internet as well. Apart from refundable amount mentioned above the partner also need to pay Rs.2360/- (non-refundable) for each segment that you want to trade into. Example if you want to trade in NSE, BSE, MCX-SX, MCX, NCDEX then the amount one needs to pay for registration will be 2360 x 5 =11800. They will provide the franchise owner with all advance trading tools to trade in Equities, Commodities and Currencies. Their centralized customer support facility solves the customer problem in a snap. They provide free advisory services for Mutual Fund. In terms of research services, they offer dedicated desk to offer quality research recommendation. After getting registered with Choice Broker, they will offer the sub broker and their employees training on their trading platform which will be free of cost. Although one need to own their own personal computer and laptop but they will provide call recording devices to trace the quality of services. Choice Broker do provide sales kit, stationary, advertisement material like banners or sunboards, sign board of the office to mark their presence. The advisory to trading are also provided free of cost to the franchise owner and to their client as well. Research reports are also not charged by Choice Broker. Their trading platform is ODIN DIET which is not among the latest trading software. Why Partner with Choice Broking? How to become partner with Choice Broker? With the above documents, one can own a Choice Broking Franchise. This entire process will take minimum 10-14 days.